Ephemeris for Friday, February 8th. Today the Sun will be up for 10 hours and 7 minutes, setting at 6:01, and it will rise tomorrow at 7:52. The Moon, half way from new to first quarter, will set at 9:48 this evening. Sirius is the brightest night-time star and is located in the south-southeast at 9 p.m. below and a bit left of Orion the Hunter. We’ve visited Sirius yesterday. But there is another star in the Sirius system that is practically invisible due to Sirius’ dazzling glare. Its name is Sirius B, nicknamed the Pup, alluding to Sirius’ Dog Star title. The tiny star was suspected as far back as 1834 due to Sirius’ wavy path against the more distant stars. Sirius and the Pup have 50 year orbits of each other. The Pup was first seen in 1862. The Pup was the first of a new class of stars to be discovered, white dwarfs. The Pup is a dying star with the mass of the Sun, collapsed down to the size of the Earth. Orion’s Belt points to Sirius. Created using Stellarium. Sirius A & B’s path in the sky showing the wobble that betrayed the Pup’s presence. Credit Mike Guidry, University of Tennessee. 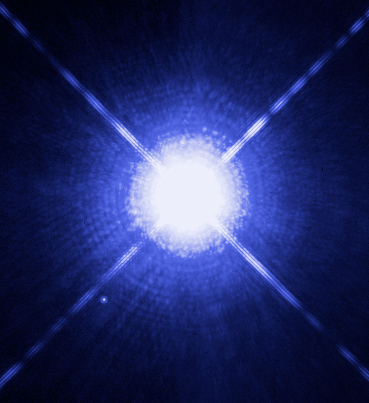 Sirius A and B (near the diffraction spike to the lower left), A Hubble Space Telescope photograph. Credit NASA, ESA. Ephemeris for Monday, January 22nd. The Sun will rise at 8:11. It’ll be up for 9 hours and 25 minutes, setting at 5:37. The Moon, 2 days before first quarter, will set at 11:24 this evening. Sirius is the brightest night-time star and is located in the southeast at 9 p.m. below and a bit left of Orion the Hunter. We’ve visited Sirius last week. There is another star in the Sirius system that is practically invisible due to its dazzling glare. It’s Sirius B, nicknamed the Pup, alluding to Sirius’ Dog Star title. The tiny star was suspected as far back as 1834 due to Sirius’ wavy path against the more distant stars. Sirius is only 8.6 light years away. Sirius A and the Pup have 50 year orbits of each other. The star was first seen by Alvan Clark in 1862 while testing a new telescope. The Pup was the first of a new class of stars called white dwarfs. The Pup is about the size of the Earth, with the mass of our Sun, and 5 times hotter than the Sun’s surface. It’s out of fuel and slowly collapsing. Orion and Canis Major Animation for 9 p.m. January 20, 2017. Created using Stellarium and GIMP. Ephemeris for Monday, February 13th. The Sun will rise at 7:45. It’ll be up for 10 hours and 23 minutes, setting at 6:08. The Moon, 3 days past full, will rise at 9:16 this evening. Sirius is the brightest night-time star and is located in the south at 9 p.m. below and a bit left of Orion the Hunter. We’ve visited Sirius last week. But there is another star in the Sirius system that is practically invisible due to Sirius’ dazzling glare. It’s Sirius B, nicknamed the Pup, alluding to Sirius’ Dog Star title. The tiny star was suspected as far back as 1834 due to Sirius’ wavy path in the sky against the more distant stars. Sirius is only 8 light years away. Sirius A and the Pup have 50 year orbits of each other. The star was first seen by Alvan Clark in 1862 while testing a new telescope. The Pup was the first of a new class of stars to be discovered, white dwarfs. The Pup is about the size of the Earth, with the mass of our Sun; its out of fuel and slowly collapsing. Ephemeris for Fat Tuesday, Tuesday, February 9th. The Sun will rise at 7:52. It’ll be up for 10 hours and 9 minutes, setting at 6:02. The Moon, 1 day past new, will set at 7:39 this evening. Sirius is the brightest night time star and is located in the southeast at 9 p.m. below and a bit left of Orion the Hunter. We’ve visited Sirius once before this winter. But there is another star in the Sirius system that is practically invisible due to Sirius’ dazzling glare. Its name is Sirius B, nicknamed the Pup, alluding to Sirius’ Dog Star title. The tiny star was suspected as far back as 1834 due to Sirius’ wavy path against the more distant stars. Sirius and the Pup have 50 year orbits of each other. The Pup was first seen by famed 19th century telescope maker Alvan Clark in 1862 while testing a new telescope. The Pup is a white dwarf star, as small as the Earth but with the mass of the sun, out of hydrogen fuel and slowly collapsing. Orion and his hunting dogs revealed in animation. Created with Stellarium and GIMP. Ephemeris for Martin Luther King Day, Monday, January 19th. The sun will rise at 8:14. It’ll be up for 9 hours and 19 minutes, setting at 5:33. The moon, 1 day before new, will rise at 7:53 tomorrow morning. | The star Sirius is the brightest night-time star in the heavens. It’s up on frosty winter evenings, and currently low in the southeastern sky in the early evening. It can be found in line and left of the three stars of Orion’s belt. It’s known as the Dog Star because it’s in the heart of the constellation Canis Major the greater dog. Sirius, however means dazzling one or sparkling one due to its brightness and the long time it spends low to the horizon where our turbulent atmosphere breaks up its light as a sparkler of color in telescopes and binoculars. Sirius owes its brightness mostly to its close proximity of 8.6 light years. It is 25 times brighter than the sun. It also has a white dwarf companion star nicknamed the Pup. Ephemeris for Thursday, January 24th. The sun will rise at 8:09. It’ll be up for 9 hours and 31 minutes, setting at 5:40. The moon, 2 days before full, will set at 6:48 tomorrow morning. 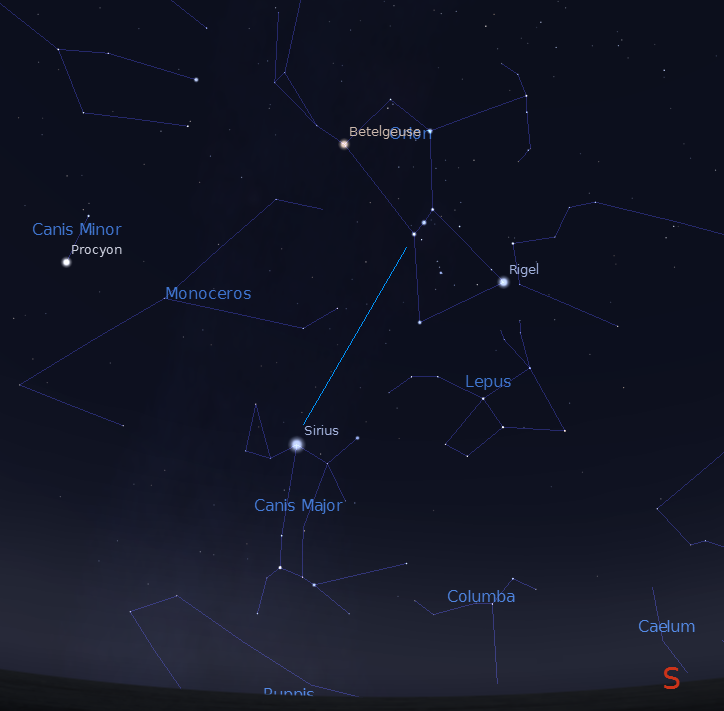 Sirius is the brightest night-time star and is located in the south at 9 p.m. below and a bit left of Orion the Hunter. We’ve visited Sirius Tuesday. But there is another star in the Sirius system that is practically invisible due to Sirius’ dazzling glare. Its name is Sirius B, nicknamed the Pup, alluding to Sirius’ Dog Star title. The tiny star was suspected as far back as 1834 due to Sirius’ wavy path against the more distant stars. Sirius and the Pup have 50 year orbits of each other. The Pup was first seen by famed 19th century telescope maker Alvan Clark in 1862 while testing a new telescope. The Pup was the first of a new class of stars to be discovered, white dwarfs. The Pup, with the mass of the sun, is only the size of the earth. The Hubble Space Telescope has two mirrors to produce its main image. The concave primary mirror, and a secondary mirror in front supported by 4 vanes called a spider. Light passing these vanes are bent or diffracted causing bright stars to have these 4 spikes. Most reflecting telescopes produce these diffraction spikes.